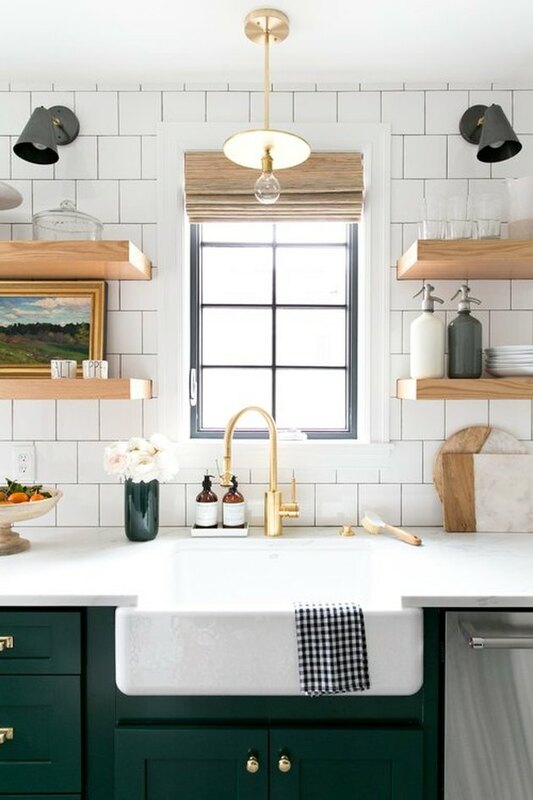 Confession: Lately, we've strayed from the beloved white subway tile trend that's dominated the design world for the last decade. Instead, we're feasting our eyes on up-and-coming kitchen backsplash ideas that have been creeping into homes far and wide this year. To put it plainly, we think we may have missed out. 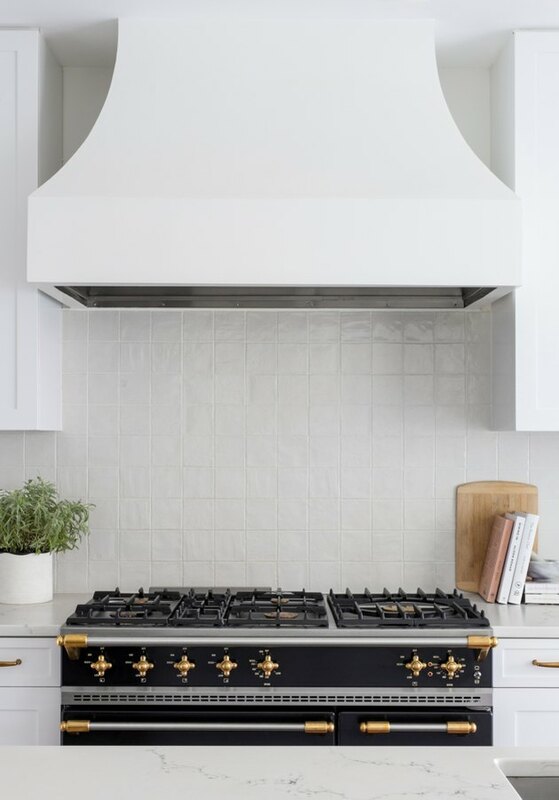 From a modern marble backsplash to a Spanish-inspired geometric design, these are the prettiest kitchen backsplashes we've seen in 2019 (so far). Keep scrolling to see seven kitchen backsplashes that made the cut — and find out how to get the look in your own home. 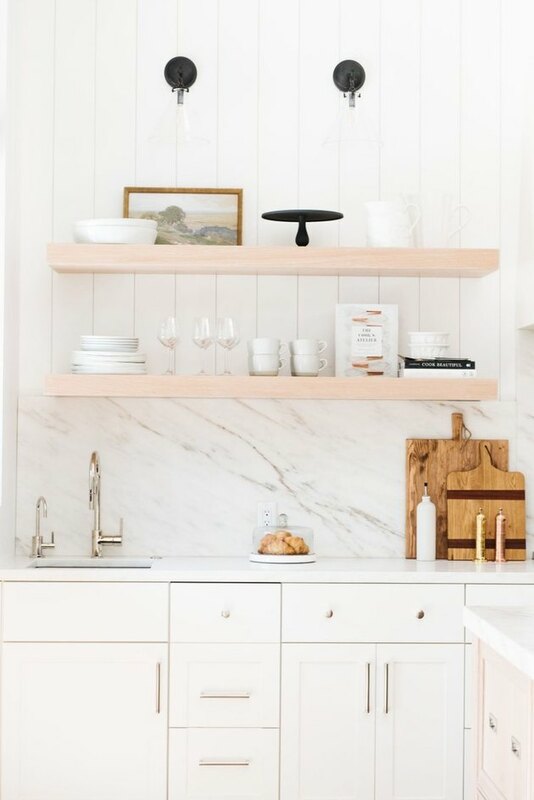 This luxurious kitchen backsplash idea designed by Shea from Studio McGee takes expansive white marble with warm veining from the countertops all the way up the wall, joining with vertical tongue-in-groove paneling as a base for open shelving. Recreate this modern look by combining white cabinets with polished hardware and wood accents for warmth. This subtle kitchen backsplash idea by Elizabeth Lawson features slightly textured, glossy tile that looks timeless and airy when combined with seamless white grout lines, while the simple grid pattern offers a hint of modern style. 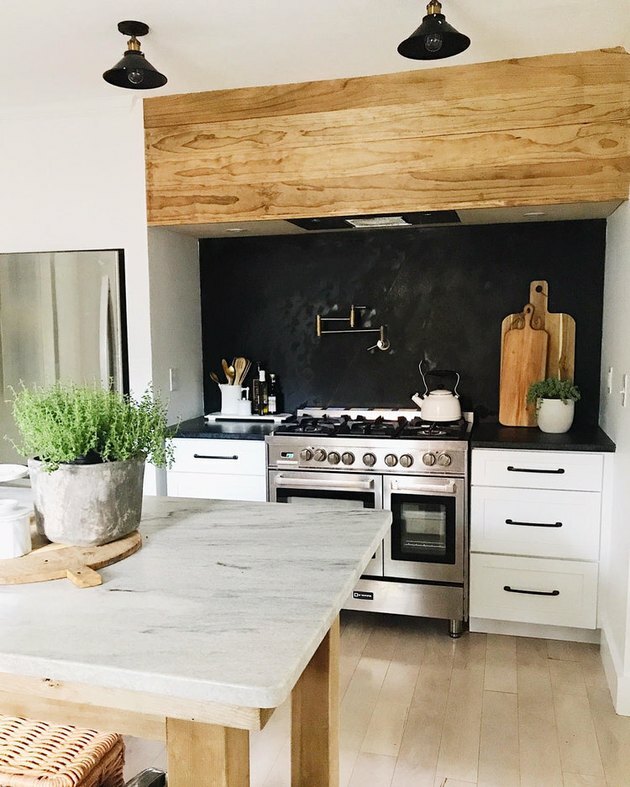 Unfinished brass hardware and warm wooden cutting boards double as decor lending modern and rustic vibes, respectively, to the space. Forgo tile altogether and use paint as a backsplash instead. This House Seven Design and Build kitchen feels classic and elegant, designed with white cabinets, farmhouse pendants, and rustic touches. As exemplified here, a moody backsplash works best as an accent wall with light flooring to provide plenty of contrast, keeping the entire space feeling crisp, clean, and airy. If you're lucky enough to live in a home with exposed brick, consider us thoroughly jealous. Keep the industrial style flowing into the kitchen for a soulful space full of character and warmth. 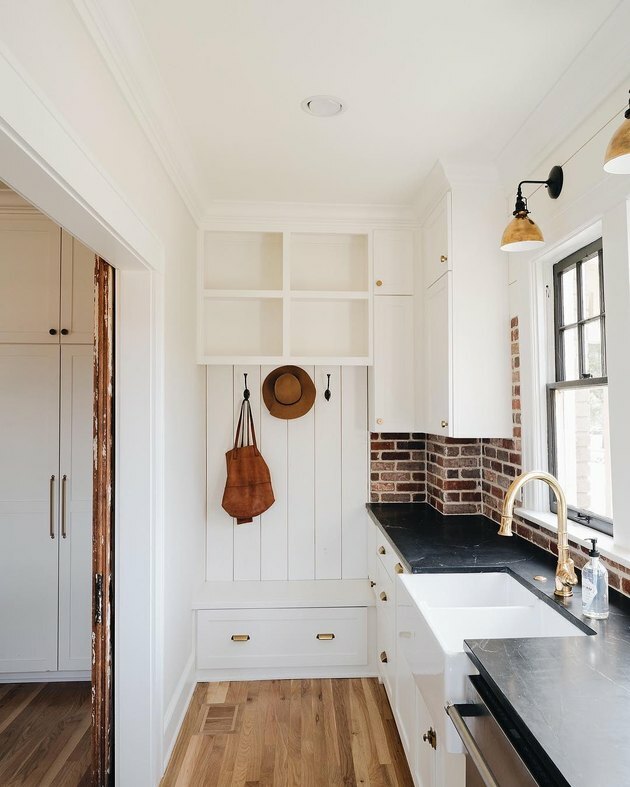 Replicate this look from Christine Zeiler Interiors by keeping your walls and cabinets bright white with brass hardware and soapstone countertops. 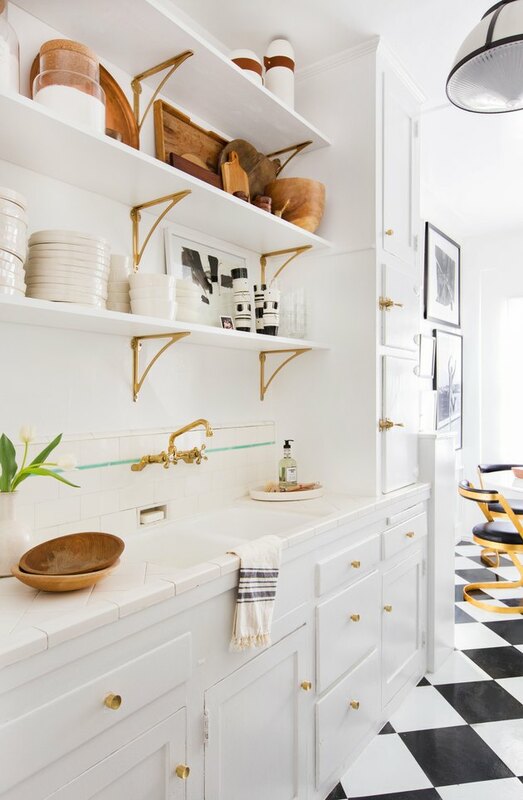 OK, so, yes, technically this is that same aforementioned classic white subway tile, but we love how Brady Tolbert from Emily Henderson Design reimagined and embraced the vintage-style look (complete with aqua accent piece) with black-and-white tile flooring, brass accents, and open shelving. Sometimes the best kitchen backsplash ideas are less about starting from the ground up and more about embracing what you already have. White square tile offset with darker grout will make a big impact when installed all the way to the ceiling. To recreate this kitchen backsplash idea from Studio McGee in your own home, choose an oversize square tile and dark grout for maximum contrast. Bonus points if you follow suit with a bold cabinet color. Classic white tile looks fresh and modern in geometric shapes that nod to Spanish design. 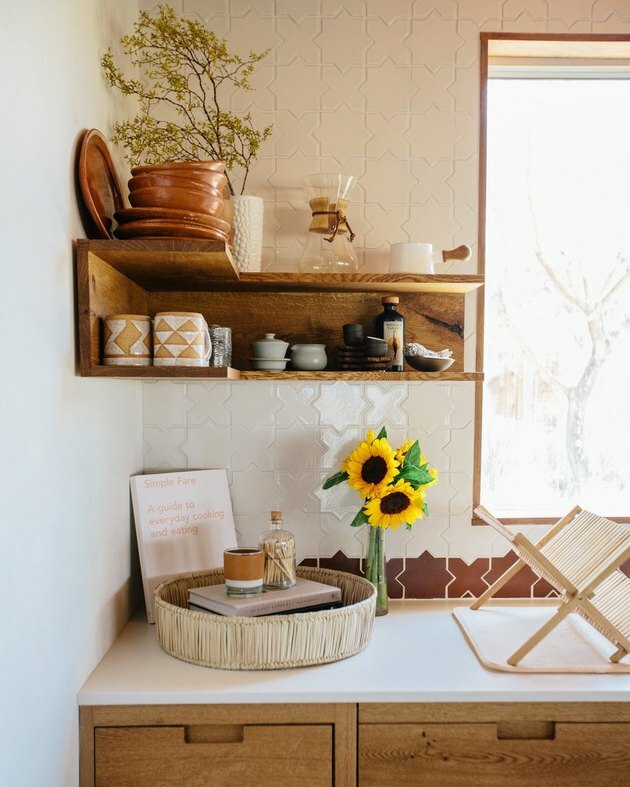 This warm and earthy kitchen — found in the Instagram-famous Joshua Tree House — incorporates rustic flair with fine-grained wood cabinets, copper accents, and natural decor. Caitlin is the former social media manager and staff writer of TheEverygirl.com in Chicago, now working as a freelance writer from her laptop in New Zealand. She loves soulful, collected interior design that feels like a warm hug, English Breakfast tea, and trips to the theatre.